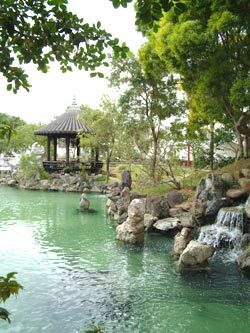 For a change in pace, head to Naha City痴 Fukusyu-En gardens. This tranquil garden is a relaxing change from the fast-paced city life surrounding it. The garden is surrounded by a white stone wall and guarded by two large shi-shi dogs. As soon as you enter the front gate, you will find yourself in the middle of an oasis of tropical plants and flowers surrounded by a beautiful landscape. Throughout the park, there are many man-made structures that are so suitable for the gardens that they seem to grow right out of the ground. This is nature and man at its best! 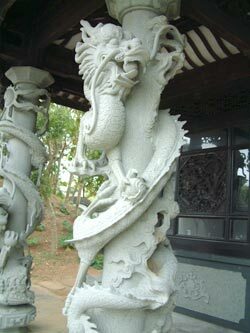 You値l also find pillars carved into the shape of dragons, statues of animals on stone bridges, and twin towers as well as diverse plants and flowers such as bamboo, ficus, and pine trees. At the rear of the park sits a beautiful waterfall descending from a height of about 15 feet into the central pond below. A stone bridge allows you to cross over the pond just in front of the waterfall. This is a great spot for family photos! You can also go through a small cave to get a view from behind the waterfall, but be careful. It痴 usually a little slippery inside the cave. Resting atop the waterfall is a large gazebo allowing visitors to view the garden's beauty in its entirety. A small staircase alongside the cave allows for easy access to the gazebo. Throughout the gardens, there are vending machines that sell small bags of food to feed the fish that live in the ponds. Each bag costs ･100 and contains only a small handful of pellets. Feeding the fish is quite an enjoyable experience; especially for children. There are so many Japanese Koi fish in the pond that the competition to feed is similar to a football pileup. 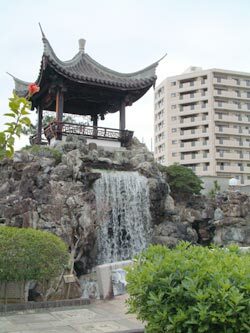 The gardens are located about 45 minutes south of Kadena Air Base. Drive South on Highway 58 past Urasoe City. As you begin to approach Naha City, look for the signs for Route 42. Turn right at the stoplight onto Route 42. The gardens will be on the left side of the road surrounded by a large, white stone wall. There is no parking at the gardens, but paid parking is relatively easy to find. Fukusyu-en is open from 9 a.m. to 6 p.m. everyday. Admission is ･315 for adults and high school students and ･105 for junior high students. Children 6 years old and under are allowed free admission.